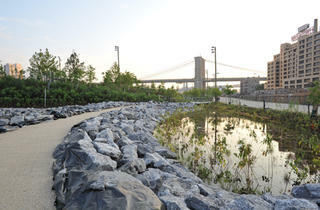 Beautiful park located in Dumbo! Take the train or walk across the Brooklyn Bridge first. You get awesome views of the skyline. Perfect for a date or an afternoon with friends. Bring a blanket to rest in the shade. You can spend hours in the park because it's huge. Definitely worth checking out the neighborhood afterwards. A really nice park, not so big but the view on Manhattan’s skyline and the Brooklyn bridge is breathtaking. I felt like I was in a movie. The park is really peaceful, and you also have a view on the Statue of Liberty. One of my favorites places in NYC I think. I always walk in this park whenever I visit dumbo. It's a beautiful park and I particularly like riding the carousel. I love walking around and taking in the neighborhood. You can look up and see the brooklyn bridge, it looks particularly beautiful at night. On any given day you can see people doing a photo shoot, as it is again, beautiful and a popular spot for photos. You can bike, run, walk, or sit on the rocks. It's a perfect place for a perfect view. One of the best parks in the city. The view is unbelievable. I would highly recommend saving some time to stop in the park after walking the Brooklyn Bridge. This meandering park has transformed the neighborhood. I don't know how it took me so long to visit Brooklyn Bridge Park. It has quickly become my favorite park in the city. The views of Manhattan are nothing short of incredible. You'll often see newly weds having their wedding photos taken here, and for good reason. It's the perfect place for a New York photo opp. While Central Park, Bryant Park, and Madison Square Park are all beautiful in their own right, I was blown away by how well kept and how much there is to do at Brooklyn Bridge Park. The DUMBO neighborhood just up the hill is also full of small shops and eateries to visit as well. This park is completely amazing, and it simply boogles the mind that some people protested it while it was in its planning stages. That's in the past, of course, and even the doubters can't complain, about one of New York's greatest Parks. Sure nothing beats Central Park, but BBP comes close if for no other reason that the amount and variation of recreational facilities: Ball fields, basketball courts, soccer pitches a swimming pool, not to mention kayaking. Then of course there is the view of the skyline, and food most noticeably on weekends when Smorgasburg is open for business. You can walk all the way from Atlantic Avenue to Dumbo and never get bored! This is probably my favorite park in the city. There is such an expansive view, room for everyone and so much to do nearby. If you've got little ones, there's the merry go round plus roller skating and basketball on the piers, right by long bike trails that snake along the water. There's all sorts of free movies during the summer with an awesome view of the Manhattan skyline, plus beautiful public art like Jeppe Hein's Appearing Rooms, which is a water fountain you can run in and out of to cool off, or Tom Fruin's colorful Stained Glass House. Catch the East River Ferry to your next destination for just $4, but grab some pizza from Grimaldi's first! 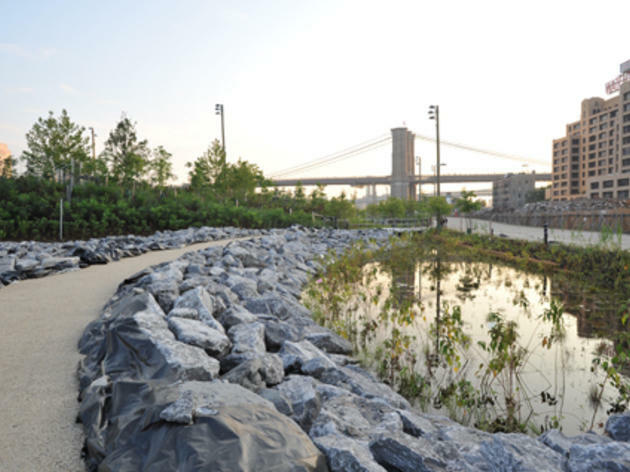 Visiting Brooklyn Bridge Park feels a little bit like stepping into a romantic movie. This place is classic! I've taken my swanky relatives there, as well as my punk rock ex-boyfriend. Pretty much anyone will adore this location. Spent 1/2 of our day there with a close friend. Fabulous view of the city and perfect to take pictures of part of New York's landscape. Would highly recommend this park for the 4th! Definitely the place to go to watch the sunset and take tons of pictures!! Spent the day there today, great time and atmosphere. Once all the new construction is finished, it will be an ideal spot for a day away.